Adeno-associated virus (AAV) is a small virus which infects humans and some other primate species. AAV belongs to the genus Dependovirus, which in turn belongs to the family Parvoviridae. The virus is a small (20 nm) replication-defective, nonenveloped virus. AAV is not currently known to cause disease and consequently the virus causes a very mild immune response. Wild type AAV can infect both dividing and non-dividing cells and may incorporate its genome into that of the host cell. These features make AAV a very attractive candidate for creating viral vectors for gene therapy, and for the creation of isogenic human disease models. The AAV genome is built of single-stranded deoxyribonucleic acid (ssDNA), either positive- or negative-sensed, which is about 4.7 kilobase long. The genome comprises inverted terminal repeats (ITRs) at both ends of the DNA strand, and two open reading frames (ORFs): rep and cap. The former is composed of four overlapping genes encoding Rep proteins required for the AAV life cycle, and the latter contains overlapping nucleotide sequences of capsid proteins: VP1, VP2 and VP3, which interact together to form a capsid of an icosahedral symmetry (Figure 1). Figure 1. Adeno-Associated Virus (AAV) Structure and Genome map. A: A cartoon showing simulated AAV size and 3-D structure; B: A picture showing electron microscopy of purified AAV vector. The Inverted Terminal Repeat (ITR) sequences comprise 145 bases each. They were named so because of their symmetry, which was shown to be required for efficient multiplication of the AAV genome. Another property of these sequences is their ability to form a hairpin, which contributes to so-called self-priming that allows primase-independent synthesis of the second DNA strand. The ITRs were also shown to be required for both integration of the AAV DNA into the host cell genome (19th chromosome in humans) and rescue from it as well as for efficient encapsidation of the AAV DNA combined with generation of a fully assembled, deoxyribonuclease-resistant AAV particles (Figure 2). With regard to gene therapy, ITRs seem to be the only sequences required in cis next to the therapeutic gene: structural (cap) and packaging (rep) genes can be delivered in trans. With this assumption many methods were established for efficient production of recombinant AAV (rAAV) vectors containing a reporter or therapeutic gene. However, it was also published that the ITRs are not the only elements required in cis for the effective replication and encapsidation. A few research groups have identified a sequence designated cis-acting Rep-dependent element (CARE) inside the coding sequence of the rep gene. CARE was shown to augment the replication and encapsidation when present in cis. Figure 2. Secondary structure of the AAV2 ITR. The AAV2 ITR serves as origin of replication and is composed of two arm palindromes (B-B' and C-C') embedded in a larger stem palindrome (A-A'). The ITR can acquire two configurations (flip and flop). The flip (depicted) and flop configurations have the B-B' and the C-C' palindrome closest to the 3' end, respectively. The D sequence is present only once at each end of the genome thus remaining single-stranded. The boxed motif corresponds to the Rep-binding element (RBE) where the AAV Rep78 and Rep68 proteins bind. 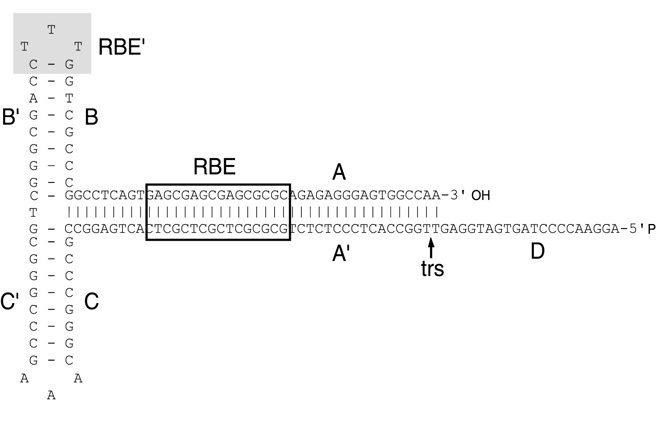 The RBE consists of a tetranucleotide repeat with the consensus sequence 5'-GNGC-3'. The ATP-dependent DNA helicase activities of Rep78 and Rep68 remodel the A-A' region generating a stem-loop that locates at the summit the terminal resolution site (trs) in a single-stranded form. In this configuration, the strand- and site-specific endonuclease catalytic domain of Rep78 and Rep68 introduces a nick at the trs. The shaded nucleotides at the apex of the T-shaped structure correspond to an additional RBE (RBE') that stabilizes the association between the two largest Rep proteins and the ITR. On the "left side" of the genome there are two promoters called p5 and p19, from which two overlapping messenger ribonucleic acids (mRNAs) of different length can be produced. Each of these contains an intron which can be either spliced out or not. Given these possibilities, four various mRNAs, and consequently four various Rep proteins with overlapping sequence can be synthesized. Their names depict their sizes in kilodaltons (kDa): Rep78, Rep68, Rep52 and Rep40. Rep78 and 68 can specifically bind the hairpin formed by the ITR in the self-priming act and cleave at a specific region, designated terminal resolution site, within the hairpin. They were also shown to be necessary for the AAVS1-specific integration of the AAV genome. All four Rep proteins were shown to bind ATP and to possess helicase activity. It was also shown that they upregulate the transcription from the p40 promoter (mentioned below), but downregulate both p5 and p19 promoters (Figure 3). The right side of a positive-sensed AAV genome encodes overlapping sequences of three capsid proteins, VP1, VP2 and VP3, which start from one promoter, designated p40. The molecular weights of these proteins are 87, 72 and 62 kiloDaltons, respectively. All three of them are translated from one mRNA. After this mRNA is synthesized, it can be spliced in two different manners: either a longer or shorter intron can be excised resulting in the formation of two pools of mRNAs: a 2.3 kb- and a 2.6 kb-long mRNA pool. Usually, especially in the presence of adenovirus, the longer intron is preferred, so the 2.3-kb-long mRNA represents the so-called "major splice". In this form the first AUG codon, from which the synthesis of VP1 protein starts, is cut out, resulting in a reduced overall level of VP1 protein synthesis. The first AUG codon that remains in the major splice is the initiation codon for VP3 protein. However, upstream of that codon in the same open reading frame lies an ACG sequence (encoding threonine) which is surrounded by an optimal Kozak context. This contributes to a low level of synthesis of VP2 protein, which is actually VP3 protein with additional N terminal residues, as is VP1. Since the bigger intron is preferred to be spliced out, and since in the major splice the ACG codon is a much weaker translation initiation signal, the ratio at which the AAV structural proteins are synthesized in vivo is about 1:1:20, which is the same as in the mature virus particle. The unique fragment at the N terminus of VP1 protein was shown to possess the phospholipase A2 (PLA2) activity, which is probably required for the releasing of AAV particles from late endosomes. It was reported that VP2 and VP3 are crucial for correct virion assembly. More recently, however, Warrington et al. showed VP2 to be unnecessary for the complete virus particle formation and an efficient infectivity, and also presented that VP2 can tolerate large insertions in its N terminus, while VP1 can not, probably because of the PLA2 domain presence. The AAV capsid is composed of 60 capsid protein subunits, VP1, VP2, and VP3, that are arranged in a icosahedral symmetry in a ratio of 1:1:10, with an estimated size of 3,900 KiloDaltons (Figure 3). Figure 3. A cartoon showing transcription and translation of Rep and Cap genes to Rep and Cap proteins. So far there are about total 12 AAV serotypes described and reported. All of the known serotypes can infect cells from multiple diverse tissue types. Tissue specificity is determined by the capsid serotype and pseudotyping of AAV vectors to alter their tropism range will likely be important to their use in therapy. Three cell receptors have been described for AAV2: heparan sulfate proteoglycan (HSPG), aVβ5 integrin and fibroblast growth factor receptor 1 (FGFR-1). The first functions as a primary receptor, while the latter two have a co-receptor activity and enable AAV to enter the cell by receptor-mediated endocytosis. HSPG functions as the primary receptor, though its abundance in the extracellular matrix can scavenge AAV particles and impair the infection efficiency (Figure 4). Figure 4. A cartoon showing how AAV infects target cell via binding HSPG receptor. Although AAV2 is the most popular and most studies serotype in various AAV-based research, it has been shown that other serotypes can be more effective as gene delivery vectors. For instance AAV6 appears much better in infecting airway epithelial cells, AAV7 presents very high transduction rate of murine skeletal muscle cells (similarly to AAV1 and AAV5), AAV8 is superb in transducing hepatocytes and AAV1 and 5 were shown to be very efficient in gene delivery to vascular endothelial cells. AAV6, a hybrid of AAV1 and AAV2, also shows lower immunogenicity than AAV2. Serotypes can differ with the respect to the receptors they are bound to. For example AAV4 and AAV5 transduction can be inhibited by soluble sialic acids (of different form for each of these serotypes), and AAV5 was shown to enter cells via the platelet-derived growth factor receptor (Table 1). Table 1. AAV serotypes and their tropisms. AAV is of particular interest to gene therapists due to its apparent limited capacity to induce immune responses in humans, a factor which should positively influence vector transduction efficiency while reducing the risk of any immune-associated pathology. The innate immune response to the AAV vectors has been characterised in animal models. Intravenous administration in mice causes transient production of pro-inflammatory cytokines and some infiltration of neutrophils and other leukocytes into the liver. The cell-mediated response to the virus and to vectors is poorly characterised and has been largely ignored in the literature as recently as 2005. Clinical trials using an AAV2-based vector to treat haemophilia B seem to indicate that targeted destruction of transduced cells may be occurring. Combined with data that shows that CD8+ T-cells can recognise elements of the AAV capsid in vitro, it appears that there may be a cytotoxic T lymphocyte response to AAV vectors. Cytotoxic responses would imply the involvement of CD4+ T helper cells in the response to AAV and in vitro data from human studies suggests that the virus may indeed induce such responses including both Th1 and Th2 memory responses. A number of candidate T cell stimulating epitopes have been identified within the AAV capsid protein VP1, which may be attractive targets for modification of the capsid if the virus is to be used as a vector for gene therapy. How Is The Recombinant AAV (rAAV) Packaged? Unlike wild type AAV, the recombinant AAV (rAAV) fails to integrate its genome to host cells. With the newly developed rAAV packaging technology, rAAV packaging nowadays does no reply on the presence of helper virus such as adenovirus or Herpse. Instead by suing a helper-free system, rAAV can be packaged easily by co-transfecting rAAV cis plasmid with Rep/Cap plasmid and helper plasmid to a packaging cell. The helper plasmid will be simulating helper virus by offering adenoviral E1, E2, E4 and VA RNAs during rAAV packaging. rAAV is then produced in the packaging cell and can be harvested 2 to 3 days after co-transfection via lysating packaging cells by 3xfreeze/thaw cycle. The rAAVs released into supernatant is then purified via ultracentrifugation (Figure 5). Figure 5. A cartoon showing how rAAV is packaged with a helper free system. Wild type AAV undergoes productive infection in the presence of adenovirus co-infection. This is characterized by genome replication, viral gene expression, and virion production. In the absence of adenovirus, AAV can establish latency by integrating into chromosome 19 (AAVS1). 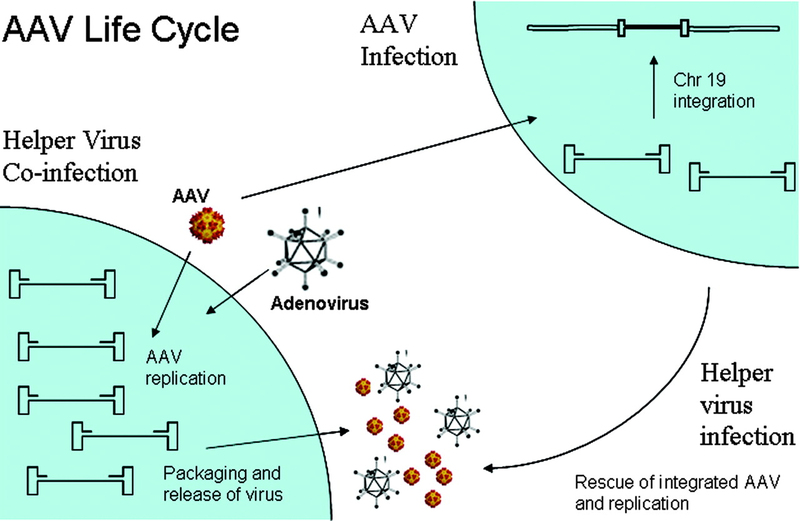 The latent AAV genome can be rescued and replicated upon superinfection by adenovirus. 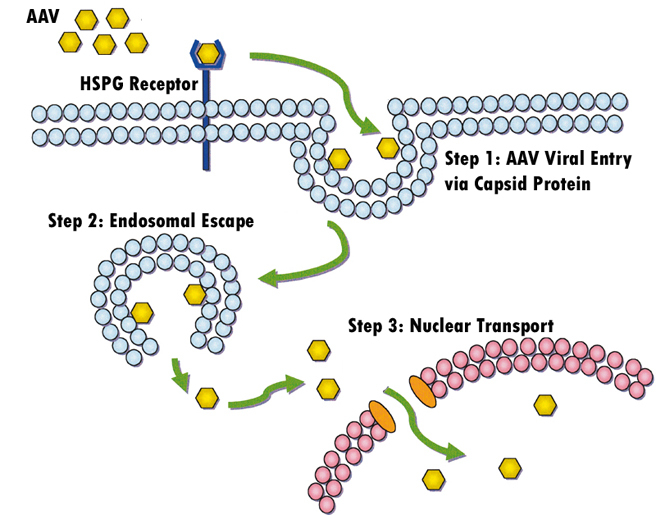 Both stages of AAV's life cycle are regulated by complex interactions between the AAV genome and AAV, adenoviral, and host proteins (Figure 6). Figure 6. A cartoon showing AAV life cycle. To date, AAV vectors have been used for first- and second-phase clinical trials for treatment of cystic fibrosis and first-phase trials for hemophilia. Promising results have been obtained from phase I trials for Parkinson's disease, showing good tolerance of an AAV2 vector in the central nervous system. Other trials have begun, concerning AAV safety for treatment of Canavan disease, muscular dystrophy and late infantile neuronal ceroid lipofuscinosis (table 2). Trials for the treatment of prostate cancer have reached phase III, however these ex vivo studies do not involve direct administration of AAV to patients.